Dark metal fillings no longer need to cause an eyesore when you smile. You can benefit from an option that blends in seamlessly with your natural teeth. Tooth-colored fillings use a composite resin material that can be customized to match your enamel color. It will effectively treat your tooth decay while enhancing their appearance. If dark tooth discoloration has caused your teeth to appear aged and dull, you can bring new life to them with a teeth whitening. Using a highly concentrated whitening agent, the enamel is deeply penetrated to get them several shades whiter. Now, you can get professional quality results in a single appointment or in about two weeks with a take-home kit. Cosmetic flaws can instantly be hidden by attaching thin shells to the front surfaces of your teeth, known as veneers. They are the perfect option to hide tooth discoloration, chips, cracks, or minor alignment issues. Overall, they improve the size, shape, and proportion of your teeth while providing natural-looking results. When compared to veneers made from other materials, porcelain has become the preferred choice. They are thinner. As a result, less of the tooth’s structure is removed during the bonding process to make the procedure less invasive. In as little as 2 weeks, you will have the flawless smile that you have always wanted. Now, metal restorations are quickly becoming a treatment of the past. Instead, all-ceramic crowns and restorations are used to repair damaged teeth while also improving their appearance. Ceramic allows them to look like a natural tooth while also making them customizable to meet your exact size, shape, and color needs. Although they are not made from metal, they remain equally as durable and effective. If alignment and bite issues are hurting your self-esteem and confidence, you can get the straight smile that you have always wanted without brackets and wires. Now, you can choose clear braces in Fayetteville to move your teeth into their correct positions. This offers a discreet and nearly invisible option to give you a straight smile in about 12 months. If you are ready to invest in your confidence, there is no better time than now. 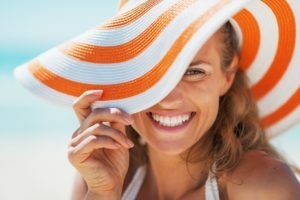 Start the summer with the flawless smile that you have always wanted by calling your cosmetic dentist today. Lyndon Family Dental strives to deliver exceptional dental care through modern dentistry. In addition to general services, we provide many areas of specialty, including cosmetic treatments. If you are interested in improving the appearance of your teeth, contact our office today to schedule your consultation for a new smile.